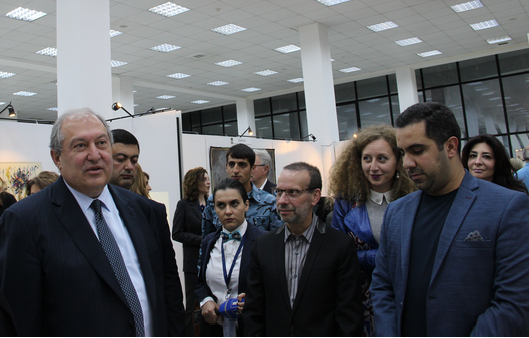 YEREVAN, Armenia ‒ The first annual Armenia Art Fair was held in Yerevan from May 11 to 14, 2018, at Yerevan Expo, during which Dr. Randall Rhodes, the Provost of the American University of Armenia (AUA), curated an art booth themed “Presence/Absence,” which featured works by Aram Isabekyan, the Rector of Yerevan State Academy of Fine Arts (YSAFA), Arthur Hovhannisyan, a YSAFA faculty member, Gia Gugushvili, the Rector of Tbilisi State Academy of Fine Arts, and Mariam Gugushvili, a graphic designer at LIVE Branding, Tbilisi. “The exhibition presented two Armenian and Georgian artists who employ their painterly surfaces as a portal into a metaphorical realm, an other world, where magic and symbols predominate,” noted Dr. Rhodes. The Armenia Art Fair aims to revive the art world in the region bringing together international participants from Europe, Eurasia, and the Black Sea region. With the help of this event the organizers want to increase the influence of Armenia on the international art scene. Besides the artwork exhibition, the fair featured a special cultural program with a musical performance by art performer, soloist, and director Christian Zehnder, a performance lecture by an art collective “Slavs and Tatars,” a fashion performance by HAYP Pop Up Gallery, as well as a round table discussion which addressed such issues as artistic globalization, art in academia, and the ever-changing art market among others.